This exercise calls for a seventeenth- or eighteenth-century still life where the artist has made a deliberate attempt to show off his skill at representing different materials and textures. I have chosen Still life with imaginary view by Laurens Craen, oil on panel, circa 1645 – circa 1650 in the collection of the Art Gallery of New South Wales (AGNSW). I feel fortunate to have a painting which fits the brief in a local collection. The painting shows a profusion of foods – fruits, meat, shell-fish, wine – mounded on a table. A drapped window opens to a distant landscape view. At first sight the composition appears as if it should be asymmetrical, with an irregular triangle of fruit, but it is actually very stable with the window upper left balanced by the leg of meat upper right. All the major elements are firmly within the picture frame, and on the right where the eye is drawn to the edge it is directed back into the picture with repeated curves of platter and melon. Curves are repeated across the picture, echoing, balancing, providing movement, accentuating the voluptuous feast. Even the hard architectural lines of the window are softened into curves by drapery and a clinging vine. 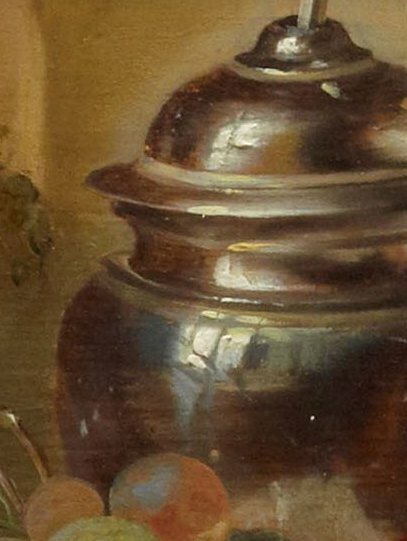 A sequence of curves runs down the centre of the painting – lemon peel and the handle of the pitcher – centering the image. The large meander of the river outside is echoed in a vine tendril in the middle right. The curve of the table leg is visible and the table largely covered, softening the edge. The mainly diagonal lines of the visible corner, wine glasses and interior of the melon highlight the curves of the rest. Much of the image is in subdued tones and shades of red and green, disrupted by the sharp, clear yellow of the lemons on the left, the pink of the meat fat above and the pale orange melon on the right. The off-white of the napkin cuts across this, forming its own triangle below. In a curious effect the napkin goes under a platter, but the creamy tones are continued across in the oyster shells. and del Vaga 21-Jul-2013), and the sliver of light under the platter plays with all the other reflections to produce a lot of complexity and interest. Most of the texture and optical effects in the picture are produced using colour with the exception of the skins of the foreground lemons. The heavy application of paint combined with the relatively light and saturated colour makes the lemons highly intrusive in my eyes. Against the frosting of the grapes and the slick of the oyster the effect on the lemons seemed heavy handed. I wonder if grime has been trapped in the paint over time and increased the visual impact of these areas. A great appearance of depth has been achieved in the painting. As well as the more obvious external view behind and projection of the falling lemon peel, one can look into the interior of the melon and even further into the dark recesses of the basket – an effect intensified by the tendril of vine catching the light in front. This painting is an example of pronkstilleven or sumptuous painting (mentioned in my post 11-Jan-2014). There is no particular iconographic significance in the items depicted. This is a decorative work intended to show the skills of the artist and the taste of the owner. Solid information on Laurens Craen is scarce. The most authoritative source I found is RKD (Rijksbureau voor Kunsthistorische Documentatie/Netherlands Institute for Art History), which shows he was born in Den Haag in 1620, was active in Antwerpen, Den Haag and Middelburg (Zeeland) 1638 to 1664 (based on membership of the Middelburg Guild) and died between 1663 and November 1670, perhaps in Middleburg (see RKD Artist Database, [n.d.]). RKD Images has nineteen pictures, but three of those are previous attributions which are no longer current (see RKDImages, [n.d.]). I found three more paintings in other searches – a total of nineteen works attributed to Craen. Curiously, I found two websites stating only twenty or so paintings by Craen are known (Lawrence Steigrad Fine Arts, [n.d.]) and (Hoogsteder Consultancy Service, [n.d.]). It’s possible both sites use RKD as their source, but otherwise it seems incredible that with a few internet searches I should be able to view the entire oeuvre of a little known artist. My tentative explanation is that many of Craen’s works are not identified – possibly in various attics and basements, but more likely through misattribution. As mentioned above three works previously believed to be by Craen have been reconsidered. Moving in the other direction Light in a Dark Niche (Hoogsteder Consultancy Service, [n.d.] a) describes the discovery of a work by Craen which had substantial overpainting, including an apparent signature by Jan Davidsz. de Heem. Careful and brave restoration uncovered the truth, and I suggest based on the web images a much more attractive and dynamic painting. My subject painting at AGNSW has its own stories. The painting was the gift of Sir Arthur Downes in 1929 and a letter from him at the time explained “‘there is a tradition that the picture was won at cards by a gambling Mytton of former days’ (Mytton was a Downes ancestor)” (Art Gallery of New South Wales, [n.d.]). Further information provided at AGNSW states the picture “was formerly attributed to the great 17th-century still life painter Jan Davidsz. 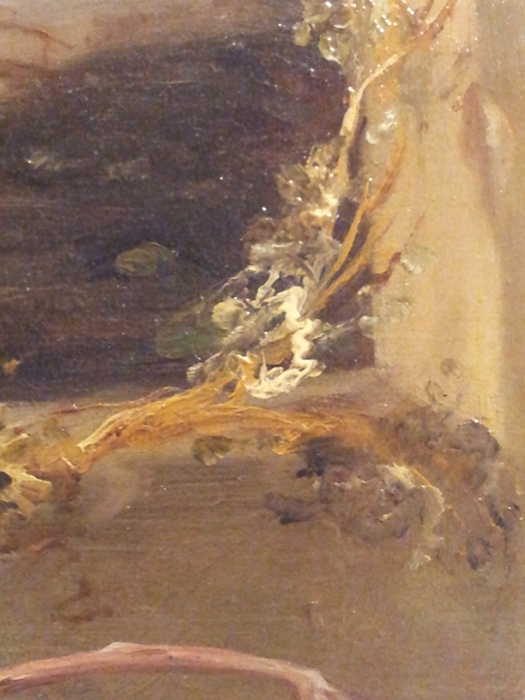 de Heem, but recent scholarship favours an attribution to Laurens Craen”. Although I have suggested the AGNSW work is purely a display of skill and wealth, elements of vanitas have been identified in two of the other works. De Jonckheere Gallery ([n.d.]) finds a butterfly “offers a disturbing counterpoint to the grape leaves that have been gnawed through by worms: the latter signifying the vanitas of the pleasures of the senses set against the promise of the eternal life of the human soul as symbolized by the butterfly coming out of its cocoon, the contrast easily takes on a greater symbolism.” Writing of another work Lawrence Steigrad Fine Arts, ([n.d.]) includes “The pipe and the glowing embers of the brazier indicate that this is a vanitas. The half empty glasses and tobacco refer to the fleetingness of earthly pleasures. The smoke produced by the tapers, brazier and pipe allude to the transience of life. Oranges are the traditional symbol for redemption as the lemon is for salvation.” Despite these I see no need to amend my assessment of the AGNSW picture. Only one other work I found included a draped window and distant landscape view and unfortunately I can’t give a stable link to it. However I have found a number of examples of similar treatments in works by Jan Davidsz de Heem, supporting the note in the RKD Artist Database roughly translated as “strong similarities between the works of Craen and Jan Dz. de Heem could indicate the presence of Craen in the studio of the Heem about 1645”. 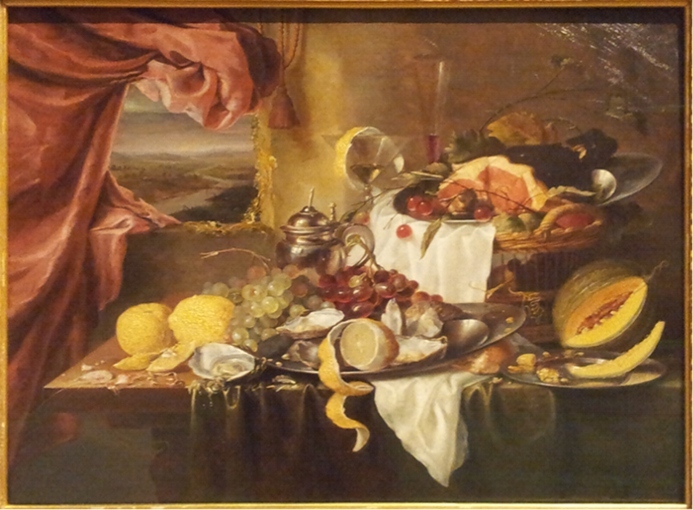 On a side note, while researching for this post I was delighted to come across a work by another artist influenced by or based on de Heem – Still Life after Jan Davidsz. de Heem’s “La Desserte” (1915) by Henri Matisse at the Museum of Modern Art (see http://www.moma.org/collection/browse_results.php?object_id=79872). This is an attractive painting with great appeal to the public (based on my observations at the gallery). The items depicted are generally well known, well executed and instantly recognisable. 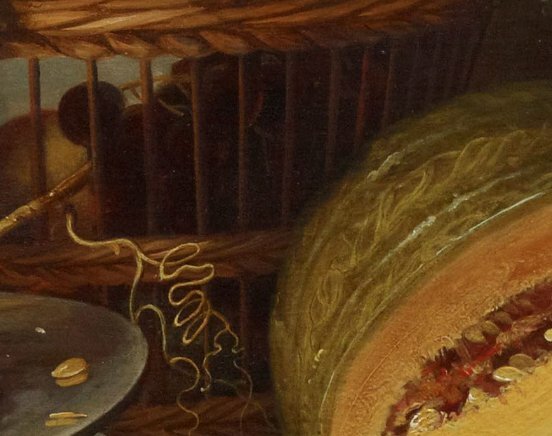 The composition is balanced yet dynamic, although there are a few anomalies in the detail such as the wine glasses whose only apparent support would be the rim of a woven basket and the rather lumpen indeterminate shape supporting the lower platter which could just barely be bread. I also find the treatment of the drapery rather stilted and unconvincing. While I found some of the colours and texture discordant, in particular the yellow of the lemons, the overall impression is light, fresh and lively, almost astringent. It is interesting to compare this to the Jan Davidsz. de Heem still life at the National Gallery of Victoria which I saw last year and showed in my previous post (11-Jan-2014, and see also http://www.ngv.vic.gov.au/col/work/4023). I remember that as a dark work with very rich and mellow tones. I wonder if different restoration treatments over time have made the contrast more extreme. 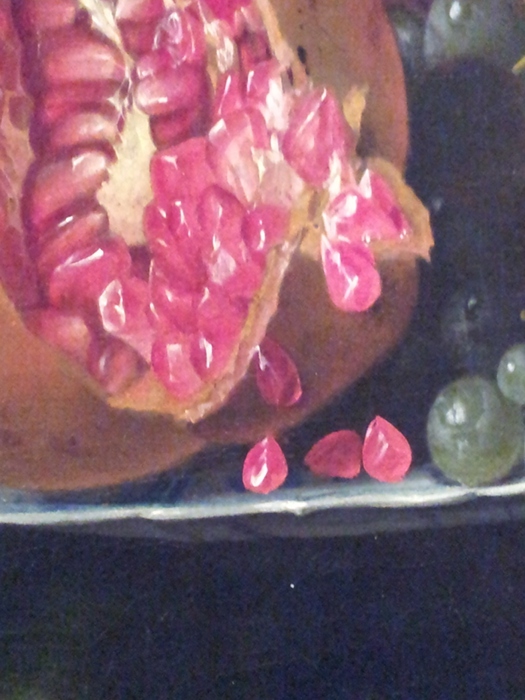 Despite more poor photography I think you can get an idea here of de Heem’s very lovely and skillful representation of pomegranate seeds, each beautiful, delicate, faceted form filled with colour and light. 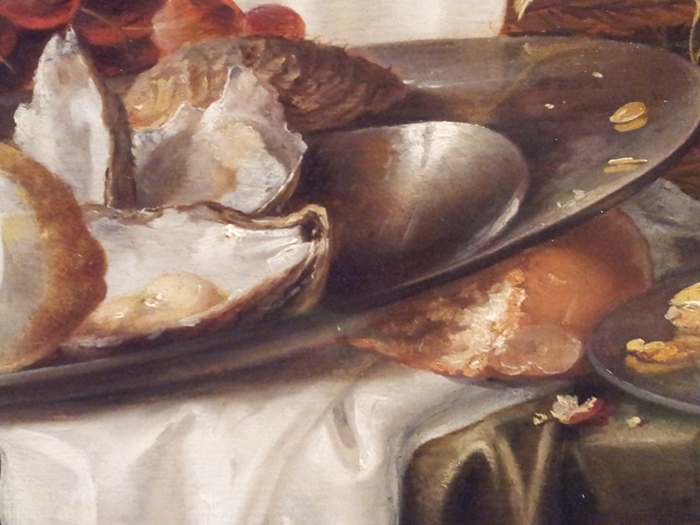 I don’t see such precision as de Heem’s brushwork in the work by Craen. Instead we see loose and lively passages such as in this section of the vine around the window casement. 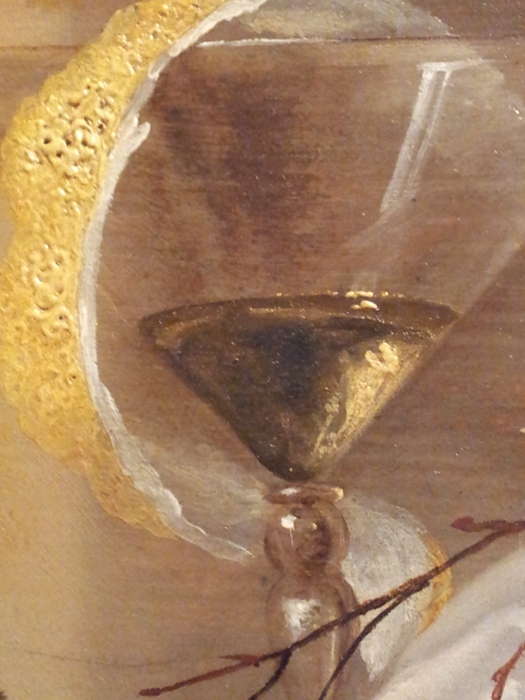 Craen had a variety of techniques at his disposal in his paint handling, as can be seen in this detail of the wine glass. As well as the lemon peel which so distresses me (although it must have been highly regarded in its day since Craen used it repeatedly), the wine in the glass looks an energetic drop while the variation in the white highlights of the bowl of the glass – straight lines showing the triangular form then a smear giving roundness – is very effective. 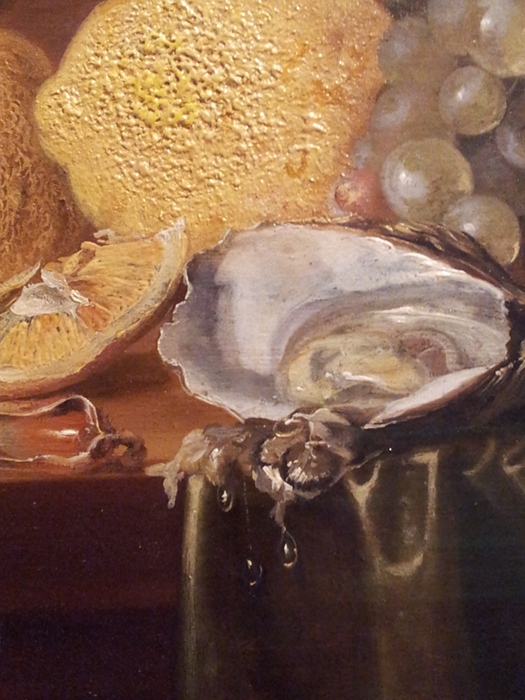 While Craen may be seen as a student, follower or imitator of de Heem he clearly had a lot of ability in his own right. To my modern eyes the freer handling and overall freshness and vitality of the AGNSW work is particularly attractive. Fascinating analysis. It’s given me a much better insight into the art work than just an overall impression.